1st Incident: Captain Jeremy Ast, Fire Medic Dave Keller, Fire Medic David Ward, Resident Volunteer Christi Davis, Volunteer Sadie Ford. 2nd Incident: Fire Medic Dave Keller and wife Roma Keller (RN at SCMC-Bend). Retired from Service Awards: Josh and Angie Ward. 5 Years: Pat Burke and Ron Ketchum. 10 Years: Roy Dean and Doug Myers. 15 Years: Julie Spor, Dave Wellington, Les Schell and Bruce Shaull. Rookie of the Year: Nick Otasu. Outstanding Fire Fitness: Nick Otasu. Resident Volunteer of the Year: Andrew Pace. EMT of the Year: Rachelle Beiler. Volunteer Firefighter of the Year: Christi Davis. Career Firefighter of the Year: Matt Millar. Fire Corps Volunteer of the Year: Margie Lombardo. Partnership Awards: Central Oregon Public Safety Chaplaincy. Volunteer of the Year: Travis Bootes. Chief's Award for Excellence: Dave Wellington. Service Recognition Award: Heather Johnson. Last Sunday, Sisters resident Leith Easterling called paramedics to check on her elderly mother, who was experiencing shoulder and back pain and feared she might be having a heart attack. The driveway at her home was in bad shape due to snow, and the paramedics' rig got stuck. When help responded to get them access, an off-duty employee came out with a snowblower and cleared driveway access and a path to the door. "They go above and beyond to help," Easterling said. "We've had to call them many times over the years, and their service has always been amazing. They always assure us that we did the right thing (by calling). They make my mom feel better - and safe. They make me feel better. They just go above and beyond." 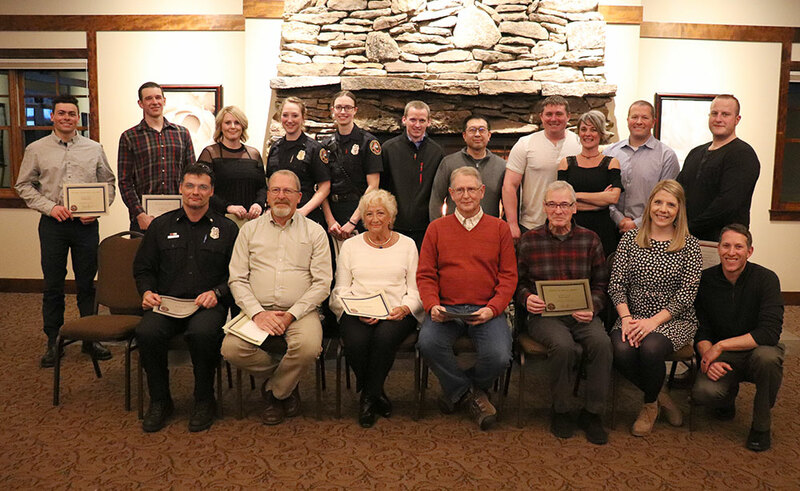 That ethic of extraordinary service to community was celebrated Friday night in the Sisters-Camp Sherman Fire District's annual awards banquet at FivePine Lodge and Conference Center. "Your great generosity has a large and lasting impact on our community," keynote speaker and fire district board member Chuck Newport told the assembled fire crews and their families. Fellow board member Jack McGowan noted that such impacts reverberate across the state. "You act in Sisters and think as an Oregonian," he said. Fire Chief Roger Johnson and Deputy Chief Tim Craig recounted a year of heavy activity, from fire incidents to significant training operations - which included a Women's Fire Academy, ongoing work with an introductory fire service program at Sisters High School, and a major multi-agency active-threat drill. The active-threat drill held at Sisters High School, had particular value and provided the district and its partners with new capabilities. "It's incredible the amount of information that was gained with this," Craig said. Firefighters and others were recognized for saving two lives from sudden cardiac arrest. Firefighter and paramedic Matt Millar was presented with a letter of commendation for his extraordinary efforts in helping a patient with significant and challenging needs with whom the district has had repeated interactions find appropriate care in the medical system. Several district officers noted that his efforts - some on his own time - exceeded even the district's high standards for extraordinary effort in service to the community. Craig made a special point of saluting the Fire Corps volunteers who serve as an auxiliary for the district. "These folks put in an extraordinary amount of time to support the operations of the district," he said. See complete list of fire district awards below.